If you are invested in a passive portfolio of ETF, chances are you will have doubts how a persistent secular rise in interest rate may mean you losing money on your bond allocations. I been wonder for this for some time, and the problem is that we are so pre-occupied that bond is rather fucked in such an environment that whether the base is really not all that bad. 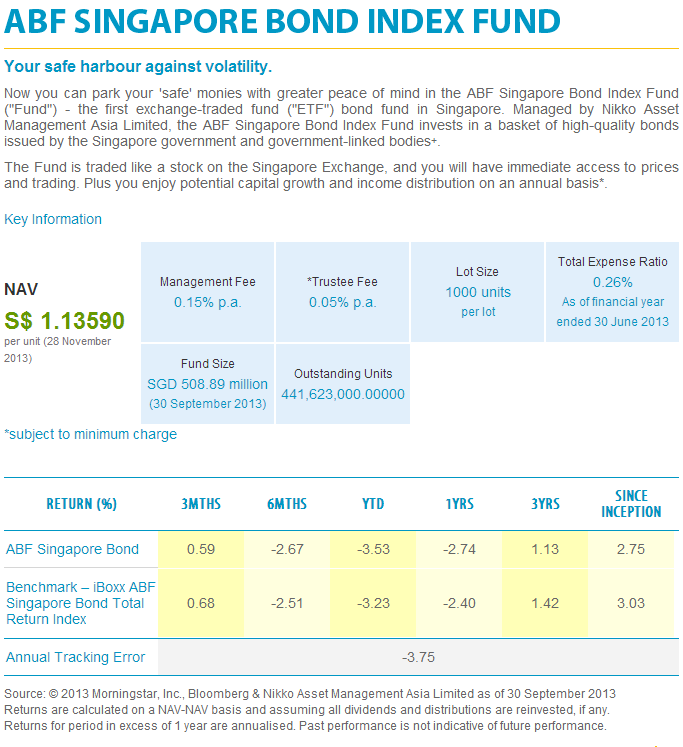 Currently in Singapore there is only 1 bond ETF which is the Nikko ABF Singapore Bond Index Fund ETF. 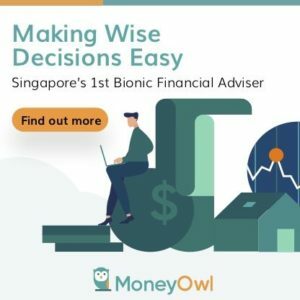 This bond ETF is listed on the SGX exchange and you can buy and sell it like your normal stocks through your POEMS, Kim Eng or Standard Chartered Online Trading brokerage. There will be time to time different asset classes becomes volatile, and if you have low correlated assets, they take turns to do better than the other. This means that when your STI ETF is losing ground, your Bond ETF will generate positive returns to offset them. Bonds and Equities are usually 2 asset classes use as primary ingredients because of the low correlations. 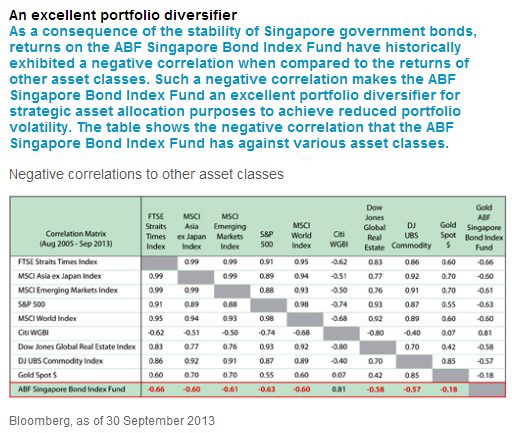 And in recent times this Singapore bond ETF seems to show remarkable low correlations to most other indexes of other asset classes. A 50% STI ETF/50% ABF bond portfolio will ensure that you are down 18% compare to 42% of your Wealth Fund. Some folks tend to overestimate their risk tolerance and a more conservative portfolio such as this can increase the chances of them keeping on the wealth building plan. The bond price are rather inverse in relationship with the prevailing interest rate. If you own a 10 year bond yielding 2% with a price of $1 and the newly issued bond yields 2.5%, why would people buy your 2% bond at $1? You can only sell it at below $1. The relation ship is vice versa. This year was the year where the stock markets got wobbly on the news that the Federal reserve may for the first time look to raise interest rate. The consensus from most of the smart guys is that the trend might be turning soon. The bond yields are likely to revert upwards. 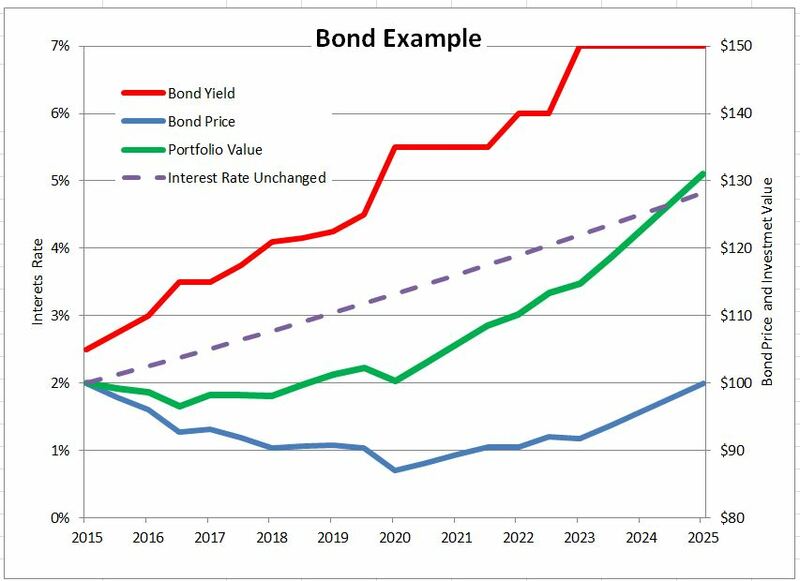 Based on this, on paper it does not bode well for bonds in general. The differences between the 3 types are larger compare to their equity cousins. An individual bond can be purchased and you can buy and sell it on a market, or you can choose to hold it to maturity to enjoy the payout initially agreed. If you hold your bond to maturity, you do not lose any money, unless along the way the bond issuer defaults because they are not financially strong enough to pay you your yield. Bond funds or bond unit trust / mutual funds are managed by active managers. These active managers will actively buy and sell these bonds based on their expertise. As investors in these bond funds you have no idea what the managers are doing. If the managers are competent they may be able to swim well in this very challenging environment, if they are not odds are the bond funds are going to not be the best place to put your money. A bond exchange traded fund differs from a bond unit trust in that the majority of them (caveat: depends on the Bond ETF policy as well) hold the individual bonds in the ETF to maturity. Technically not to maturity. What I understand from Nikko AM is that they tend to sell off their maturing bonds (those with duration < 1 year) and use the sum to buy a new long duration bonds. Bonds that are near maturity are stable in prices since there are not much yield embedded in the prices. If you sell of near maturity bonds, the bond ETF intrinsically do not suffer much losses. 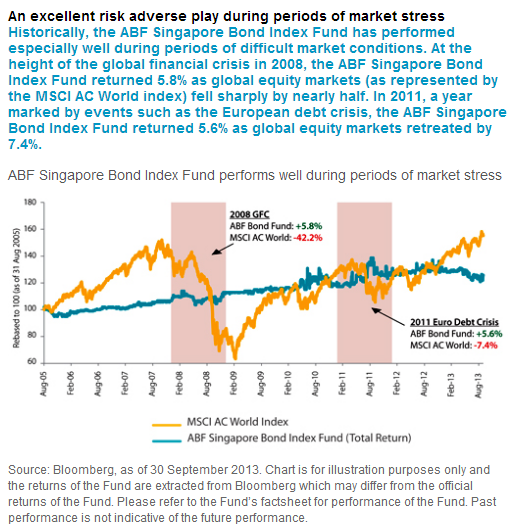 In short, ABF Singapore Bond Index Fund tends to be rather mechanical. What you see is what you get unlike a bond unit trust where you may get positive or negative surprises. Although we want low correlations, at the end of the day, we want all asset classes in our portfolio to eventually end up appreciating. What good is it if the equity ETF portion makes money and the bond ETF 20 years later ends up negative. Technically if for the next 20 years the interest rate trends up, the current portfolio holdings should fall in prices. Specifically they look at a period where interest rate have been trending upwards. We hope the previous section explains the need to look at this from a total return angle. On an individual bond basis, its even harder to lose money to rising rate. As long as you hold the bond to maturity, and provided the issuer of the bond do not stop paying you ( this is called a bond default), when the bond matures they will return you 100% of your money. The case here is a person who holds a single 10 year treasury bond to maturity. So if he buys it in 2015 it matures in 2025. Coincidentally, during this period, rates starts rising! His world will be crashing down. His opportunity cost of leaving the money in this bond, is that the bonds of the same risk newly being issued now gives him a higher yield. The chart above shows that at 2025, he didn’t end up losing money. In fact the risk adjusted returns was decent. So why are there so much noise? The key here is to recycle the wealth and reinvest it consistently. Rising rates do not necessarily mean negative returns for bonds! Although bond prices are inversely correlated to interest rates it does not necessarily mean that bond returns are inversely correlated to interest rates. On this argument, it seems from a portfolio perspective, the case for bonds in the portfolio is much intact. The media rhetoric seem to have confuse the long term investor. Still if we are long from that perspective, total returns is what that matters. 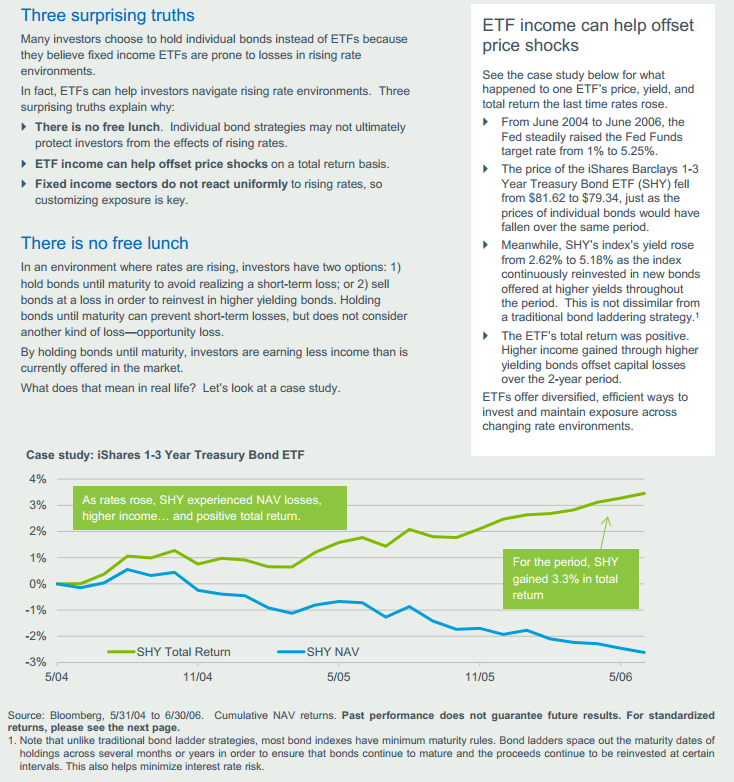 And if we are looking at that, bond ETF provides a very easy way to gain exposure to these high quality fixed income. We haven’t even consider the commission. The costs have taken out a lot of the returns possibly and it is likely that investors should do a lump sum yearly investment if their sum is not large enough to ensure low commission. Still, the returns are better than cash currently, and in a rising interest rate environment, the bond ETF yields will go up and will make it more worthwhile. Like this article? Continue to learn to build wealth from my best resources over here. Currently i have posb invest saves rsp of $100 per month for nikko am sti etf. Does this means that i should also put $100 into ABF Bond? For this ABF bond, does it also have dividends payout? For this ABF bond, is it that i have to put a certain amount of years to get that certain amount of percentage? Can you tell me more about this ABF Bond? I think more information can be gotten from ABF Bond brochure. The ETF does distribute but its at the manager’s Nikko discretion. Its an aggregate of ongoing bonds so you can only forecast the prevailing bonds. I am curious about how the Singapore Bond ETF total returns. While I understand NAV will be down in rising interest rates environment, how is the higher overall total returns being realized to the investor in this case? Dividends? how is this compared to SSBs? 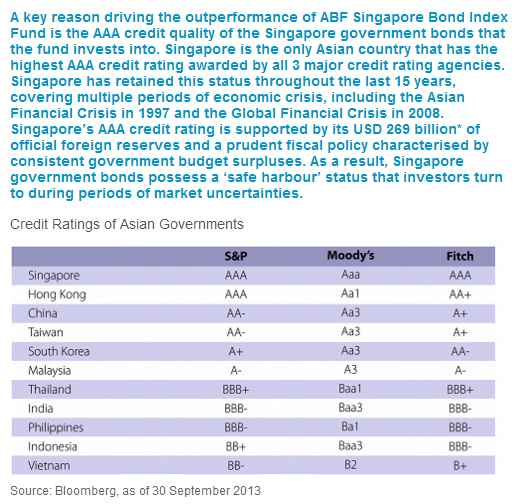 hi foo, i rate the ABF Bond’s quality to be between the normal corporates and SGS Bonds, which is the basis of SSB. Their duration is typical 5 years average so they are not subjected to higher volatility to interest rate risk. 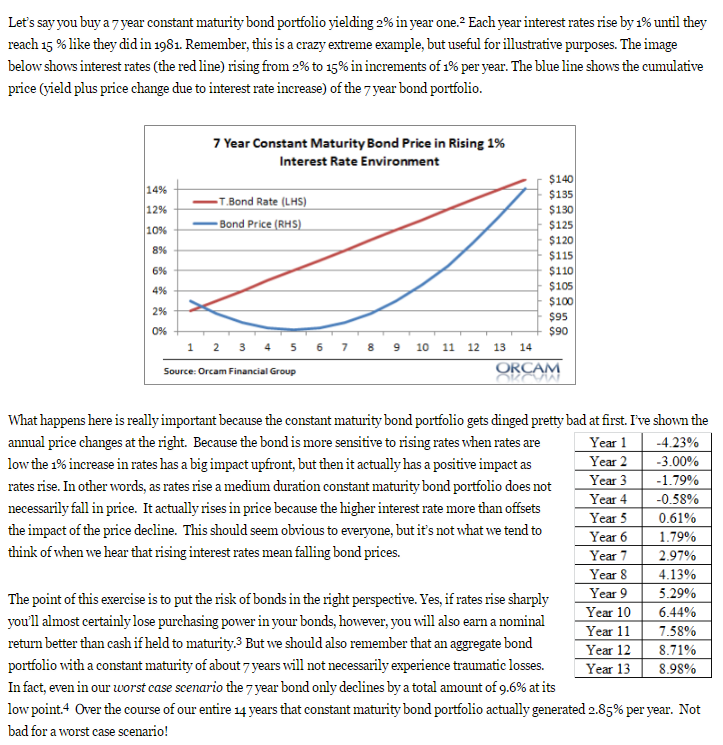 Thanks for the excellent article, I have been trying to understand the impact of impending interest rise on bonds. Based on your explanation is this a good time to buy ABF Etf given the expectation of interest rate hike? Hi Preeti, if you understand the explanation you would realize that there is no good time or bad time. Rates will moderate up. its just when. even if i tell you now it is a good time, what is going to happen is that are you going to hold on when rates eventually go up or do something else. I remember you posted about this years back and searched for this post. It would seem that the ABF bond ETF’s returns have been declining since rates started to go up. in the last 6months (till end Jan 2018), the ETF’s total returns have been negative 0.26%. Why do you think this has been so? Hi serendib, i think it takes some time for the higher yield earned from the reinvested bonds to move the needle and offset the price losses. Over the short term, it is negative for bonds. You will see the bonds you own go down in value and therefore this ETF will tend to trend downwards.